Sakya Pandita, the fourth of the five founders of the Sakya Order, was born in the year of the Iron Female Pig (1182) in Sakya , Tibet . He was the nephew of Jetsun Drakpa Gyaltsen, who was the third of the five founders of the Sakya Order. 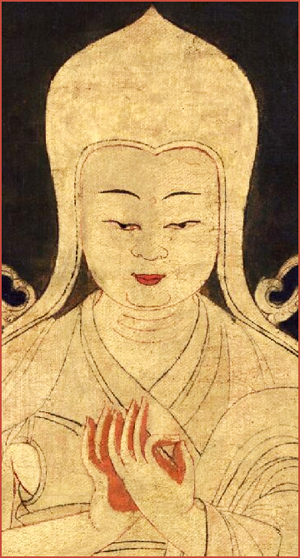 Sakya Pandita became one of the greatest scholars and meditators to take birth in Tibet . 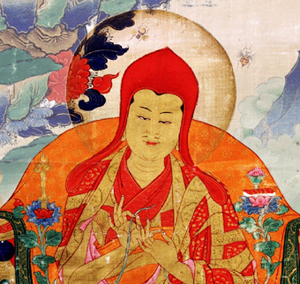 Sakya Pandita was the real Vajradhara, however, some beings perceived him as an ordinary Dharma teacher. Yet I witnessed some truly amazing holy events, which I here recount. When the Lord of Dharma entered the womb of his mother, who was Macheg Nitri Cham from Karpu, a sign appeared in his mother’s dream that a Bodhisattva had entered her womb. She dreamed that a beautifully dazzling king of the nagas, with a precious crown and other jewels, asked her to give him accommodation. While he resided in the womb, his mother’s body felt light, healthy and blissful, and excellent samadhi arose in her mind. When Sakya Pandita was born, a multitude of auspicious signs appeared that a Bodhisattva had been born. When Sakya Pandita matured to the stage that he could crawl, he spoke to his mother in Sanskrit, which was a sign of the ripening of the habitual tendencies of his previous lives. But because his mother did not understand his words, she was afraid that his speech was abnormal. She told Jetsun Drakpa Gyaltsen that her son spoke words she could not understand, and asked him if there might be a problem with her son. Drakpa Gyaltsen understood that the child was speaking Sanskrit, and replied that she should not be afraid that her son was abnormal. The child drew the Indian alphabet on the dust of the ground with his fingers, with all the vowels and consonants in both Nagara and Lansa scripts. Then, afraid that others may step on it, he erased them. Sakya Pandita said that he had learned to read both Sanskrit and Tibetan without being taught so long ago that he did not recall which he had learned first. When Sakya Pandita grew a bit older, he learned without difficulty further studies in Tibetan and Sanskrit; astrology; medicine; art such as drawing and design; and other subjects. While still a youth, he already was a treasury of wisdom and good qualities. Because of this, many learned masters, including those who were his own teachers, unanimously stated that he was not ordinary, and that undoubtedly he was an emanation of an enlightened one, or a greatly blessed being. All were amazed at his abilities. While still a child, Sakya Pandita received empowerment from his father, Vidhyadhara Palchen Opo, and studied the Hevajra sadhana Lotus Born, as well as a six-limbed sadhana, and the associated practices, as well as the Chakrasamvara Tantra. Every day he performed the practices of Arya Achala, Manjushri, Avalokiteshvara, and many others. He thoroughly studied and mastered a number of important tantric, sutric, and medical texts and also gradually received empowerment, blessings, tantric explanations, and pith instructions on the Dharmas of the founders of the Sakyapa and their ancestral masters. 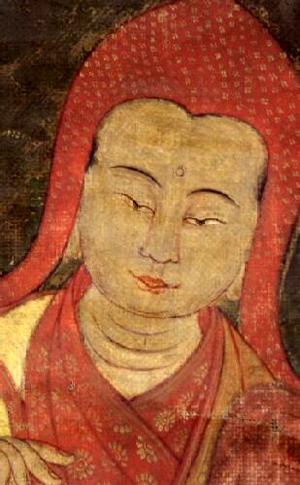 At the age of eight, Sakya Pandita gave a commentary on the Lotus Born Hevajra sadhana. At the age of twelve, he gave a commentary on second chapter of the Hevajra Root Tantra. At the age of fourteen, he explained the common commentary Samputa Tantra. By the age of fifteen, he had completely mastered all of the Dharmas belonging to his father and the founders of the Sakyapa. Once night when he was eighteen, Sakya Pandita dreamed that he received the complete teachings on the Abhidharma Kosha directly from Vasubandi, in front of Achi stupa behind Sakya Monastery. He experienced that night as an entire month, with one teaching session each morning for thirty mornings. Master Vasubandi faced the east; his complexion was slightly blue and he was of middle years. 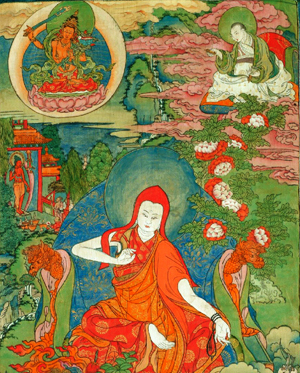 Sakya Pandita sat to the right of Master Vasubandi, facing the north, reading the text while receiving the teaching. The next morning when Sakya Pandita awoke, he had both the words and the meaning of the entire Abhidharma Kosa in his memory. Later, when he actually received the teaching of the Abhidharma Kosha from the Kashmiri Pandita Shakya Shri Badhra, it was exactly the same. One night, someone appeared in his dream and said, “I want to give you the throne of the Master Dignaga. Please follow me.” So saying, he was led to a cave in India and told, “This is Master Dignaga’s cave.” When the cave door opened, one side of the cave was filled with texts. After this dream, special wisdom arose in him, through which he could unmistakenly understand the meaning of treatises on logic. At the age of nineteen, Sakya Pandita received teachings on logic, and the Dharmas of Maitreya from Master Shuhrul at Trang. When he was twenty, he traveled to meet Master Tsur Zhonnu Sengge, at Nyangtod Changdul. From him he received teachings on the Pramana. After only one hearing, he completely and unmistakably knew every word of the teaching and its meaning, and he asked the master for permission to give that teaching to others. Sakya Pandita also began to teach the master’s students the Pramanaviniscaya and a commentary on that text, giving two sessions per day based on the teachings of the master. In this way, within a month, he gave both the root text and a commentary on the Pramanaviniscaya from memory. The entire assembly was amazed at his ability. 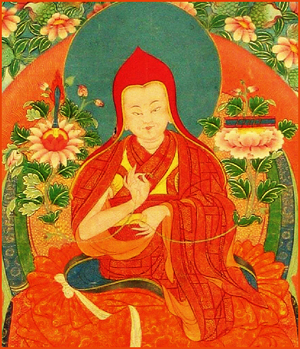 Sakya Pandita received the teaching of the Madhyamika Collection of Reasoning from the same master, Tsur Zhonnu Sengge. After that, he returned to Sakya to perform rituals of behalf of his father and spiritual master, who had passed away. Having completed these, he collected a large quantity of gold and other offerings for his master Tsur Zhonnu Sengge, and set out to see him. On the way, Sakya Pandita met the Kashmiri Pandita Shakya Shri Badhra who was giving the teaching on logic known Tsema Chuchok at Tsang Chumik Ringbo (Long Spring.) Sakya Pandita sent his attendant ahead to offer all of the gold and other offerings to his teacher Tsur Zhonnu Sengge, and remained to receive teachings from Shakya Shri Badhra. Sakya Pandita asked Shakya Shri Badhra, “What Tibetan masters teach is said to be barely bluish, but not blue itself. What does this mean?” Sakya Shri Badhra answered, “Blue itself exists as it is. But I don’t know what “barely bluish” means.” Through this answer, Sakya Pandita realized the essential point of the entire discipline of logic. Shakya Shri Badhra went to Central Tibet , and while he was gone, Sakya Pandita invited Pandita Sugata Shri to come to Sakya. From him he intensively studied Sanskrit, logic, poetry, composition, rhetoric, and other subjects for two years. Later, when Shakya Shri Badhra returned to the region of Tsan, Sakya Pandita went to pay his respects and requested full ordination, which Shakya Shri Badhra accepted. Thus, at the age of 25, Sakya Pandita shaved his hair at the temple of Nyangmit Gyen , the seat of the great master Lotong, and received ordination at Nyongchong. In the ordination ceremony, the Kashmiri abbot Shakya Shri Badhra was the principal abbot, Bodhisattva Kyewole served as master of activities, Master Shohul served as master who shows the secrets, and the ceremony was witnessed by other respected masters among an ocean-like gathering of the sangha. Shakya Shri Badhra advised him, “Now that you are fully ordained, it is important to be diligent in keeping the vows.” He appointed the Venerable Jodan as Sakya Pandita’s vinaya instructor. Venerable Jodan was extremely strict in all observances, and constantly corrected even the most minor infractions. Then from Shakya Shri Badhra, Sakya Pandita studied the logic text Seven Categories of Pramana as well as commentaries and supplementary works on that text. From both Shakya Shri Badhra and Bodhisattva Kyewole, he also studied many other teachings on vinaya, sutra, and tantra. Sakya Pandita meditation had developed to the level of inconceivably steady samadhi, so he was able to realize the relationship between outer and inner interdependence, and to prophesy future events. When he meditated or concentrated, nothing whatsoever could disturb him, even amidst a crowd of people. “When I was young, I asked my lama, Jetun Drakpa Gyaltsen, to bestow the guru yoga blessing but he refused, saying, `You do not regard me as the Buddha, and instead regard me as your uncle. You are yet unable to dedicate your body and all possessions to the lama.’ Later, fearful signs of my death arose, and my health was indisposed. At the same time, my Dharma Lord manifested some discomfort for a few days. At that time, I served him day and night without rest, thought of sleep, or food. This seems to have purified some of my negativities. It is said that my Lord received teachings directly, not in dreams, in the Sakya Monastery itself, from the space in front of him. He also clearly heard a voice which seemed to arise from his heart, saying, “In your twenty-seven previous lives, without interruption you were born as a Pandita, greatly learned in the Pramana Virtika.” Later, he again heard the same voice, but instead of “twenty-seven,” it said “thirty-seven.” He personally related these events to me. Once, when Sakya Pandita manifested slight discomfort, Manjushri, Nagarjuna, Shantideva, and other holy beings manifested to comfort him. Some disciples with pure perception, such as Podon Rinpoche and others, perceived him as inseparable from Manjushri. My Lord was also clairvoyant. One example of this occurred when my Lord visited the north. While he was there, in the middle autumn month of the wood female snake year, and again in the last autumn month of the iron male dog year, he declared that he would depart for another realm in the iron pig year. Some of his close disciples heard and recorded this, and it later occurred just as he had predicted. 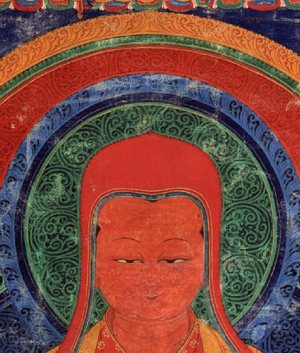 Regarding Sakya Pandita’s composition, it is said that texts can be composed for two purposes: primarily to benefit others, and primarily to demonstrate elegant composition. When composed primarily to benefit others, the words and meaning of his texts are flawless, logical, clear, in harmony with the sutras and tantras, and beyond criticism, even by the most learned. Indeed, all of his writing is amazingly beautiful.. Some of his works were composed primarily to demonstrate elegance in composition, such as Homage to the Sugatas, Beseeching the Compassion of the Enlightened Ones, and Elegant Speech. All of these works are beautifully composed, the words and meaning are in balance, and the metaphors do not contradict the meaning behind them. Clear distinctions are made between the types of prose, heavy and light accents, and long and short sounds. The words and punctuation beautify and ornament the compositions. Although they are elegantly written, their meaning is clear, and the poetry is easy to recite and pleasant to hear. All of his writings are as works of pure gold, ornamented by jeweled tassels. It could also be said that they are like a garden of perfect pearls, extremely beautiful and elegantly composed. When his compositions are read or heard by others, they delight the learned, are suitable for quotation by the intelligent, and are the object of admiration by the wise. Concerning Sakya Pandita’s debate, because he possessed peerless intelligence and had attained fearless courage through realizing the meaning of every scripture exactly and correctly, all of his speech was flawless, and his statements faultless. His words were beyond criticism, and therefore, the courage of every challenger quailed. He defeated many Tibetan masters who were known as great scholars, and outshone many Buddhist panditas of India . He also defeated masters of other religions. For instance, Harinanda was famous throughout India for his learning. When he heard of the fame of Sakya Pandita, he came to Tibet to challenge him to debate, together with six other learned Hindu masters. Sakya Pandita thoroughly defeated all of them with his wisdom, and placed them in the right view. In this way, Sakya Pandita’s mind rested in the profound samadhi of the two stages throughout his entire life. Until the age of 63, he engaged in study, contemplation, meditation, teaching, composition, and debate in Tibet . Through this, he served the doctrine of the Buddha, like the rising of the morning sun, and his fame pervaded the world. In the latter part of Sakya Pandita’s life, his fame reached the ears of Kodan Khan, the son of the Mongolian emperor. The Khan said, “I have heard of a famous Buddhist teacher in Tibet known as ‘Sakyapa.’ I wish him to be invited here.” Thus he sent his general Tortak to invite Sakya Pandita. When Tortak arrived in Sakya and offered an invitation letter from the Khan, Sakya Pandita remembered that his teacher Jetsun Drakpa Gyaltsen had prophesized, “Later in your life, people from the north will invite you to their homeland. At that time go without hesitation as it will be of great benefit to the Buddha’s doctrine.” Thus Sakya Pandita accepted the invitation, rejoicing in the occasion. In the year of the male wood dragon, at the age of 63, Sakya Pandita embarked for China , with two nephews. On his journey, many famous learned masters and other fortunate disciples requested empowerments, blessings, explanations of the tantra, and pith instructions. He fulfilled the requests of each of them according to their needs, and turned the wheel of Dharma in many places of Tibet . Traveling thus, the journey to China took three years. When Sakya Pandita was sixty-five, in the eighth month of the year of the male fire horse, he reached the emperor’s palace in Lingchu. At that time, the Emperor Kodan Khan had gone to Mongolia , for the celebration of the enthronement of Goyuk Khan. The emperor returned to Lingchu in the beginning of the next year, the year of the sheep, and had an audience with Sakya Pandita in the palace. The Khan was delighted to meet Sakya Pandita and they had a relaxed discussion of Dharma and ordinary affairs. Before Sakya Pandita arrived in Lingchu, there were already some Tibetan monks at the palace. However, they had been unable to demonstrate any special activities to evidence the good qualities of the Buddha’s Dharma. Because of this, at gatherings in the palace to perform aspirations and prayers, the Mongolian folk practitioner Erkawun, and the Mongolian oracles were seated at the head of the assembly and led the chanting of aspiration prayers. The Lord of Dharma Sakya Pandita and Kodan Khan engaged in extended intensive discussions of Dharma. When the Khan could not understand various important points, scholars and practitioners from Yunnan assisted him. Through this, the Khan came to have a good understand of the meaning of the Dharma, and he was delighted to receive teachings from Sakya Pandita. Soon, the Khan decreed to his subjects that the Mongolian practitioner Erkawun and the oracles should not sit ahead of the Buddhist monks, and that the Lord of Dharma Sakya Pandita should preside at the head of the assembly. He also decreed that throughout the land, Buddhist monks should lead the chanting of aspirations and prayers, and that their position should be venerated. The emperor had a skin disease, and Sakya Pandita performed the ritual of the Bodhisattva Singhananda, which completely cured his skin disease. Through this, the emperor became extremely devoted to Sakya Pandita. The emperor requested and received profound and vast Dharma teachings, beginning with the Bodhisattva’s Vow in the Mahayana Tradition, and many other texts. He venerated Sakya Pandita highly, and from that time on, Sakya Pandita bestowed many Dharma teachings in a multitude of languages, for different ethnic groups. Through this, those who were not previously devoted to Buddhism were placed in the path of the Buddha, and those who were devoted were placed in the path of the Mahayana. In short, he placed countless sentient beings on the stage of maturation and liberation and caused the Buddhist doctrine to flourish throughout the land. This great teacher, the second omniscient one in our eon, remained in this world until the age of seventy, causing the doctrine to flourish, and aiding countless sentient beings by maturing them and placing them in the state of liberation. Yet ultimately, the holy one rested his intent in the realm of reality. In the year of the female pig in the month of Takar, when Sakya Pandita intended to depart for the benefit of other beings, eighteen great signs occurred, which were witnessed by his physician Biji, nephew Chogyal Phagpa, and others. Many holy beings such as Manjushri, Maitreya, Avalokiteshvara, and others manifested in the sky and Sakya Pandita and others clearly perceived them. One night, early in the morning, Sakya Pandita’s root guru and uncle, Jetsun Drakpa Gyaltsen appeared in the sky, together with the Mahasiddhas Virupa and Krishnapa. Jetsun Rinpoche Drakpa Gyaltsen spoke to Sakya Pandita giving him encouragement. Then Mahasiddha Virupa dipped his ring finger in the nectar in the skull cup which he held, and asked me to extend my tongue. 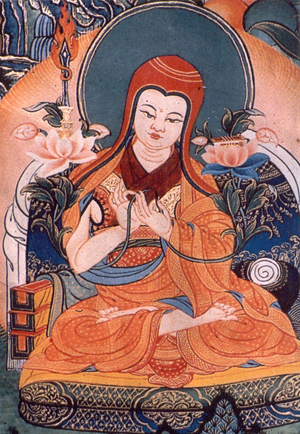 He put the nectar droplet upon my tongue, and at that moment Sakya Pandita experienced a very exalted non-conceptual realization of bliss and clarity. Jetsun Drakpa Gyaltsen said, “When he departs the third life, he will be born as Buddha Vimalashri, and perform the benefit of countless beings.” Having said this, Jetsun Drakpa Gyaltsen gazed back at the Mahasiddha Virupas, and Krishnapa, saying, “Isn’t that true?” Both affirmed this, each saying, “That is so.” Sakya Pandita then performed a tsog offering and the practice of Profound Guru Yoga. As a result, an ushnisha clearly appeared on the top of Sakya Pandita’s head, and a white circular hair appeared between his two eyebrows, like the curl of a conch shell. These and many other perfect physical qualities manifested on his holy body. On the fourteenth of the month of Malpo, early in the morning, there occurred a multitude of celestial offerings and victory banners, together with the music of celestial instruments, song, and a multitude of offerings. The earth trembled greatly, and the great Dharma Lord Sakya Pandita departed into peace. On the twenty-fifth of that month, when the holy body was cremated, the smoke manifested in the colors of the rainbow, and all who gathered heard celestial music. All of the relics produced ringsel. Like seeing a conch shell as yellow. As you perform holy deeds. Translated from the Lam Dre Teachings, Volume Ka by Venerable Lama Kalsang Gyaltsen and Ane Kunga Chodron. Translation begun on the auspicious day of Lord Buddha’s Descent from Heaven, and completed on the auspicious day of Sakya Pandita’s anniversary, 1997.